Probably the most noticeable way automation is changing the way we work is happening now in retail. 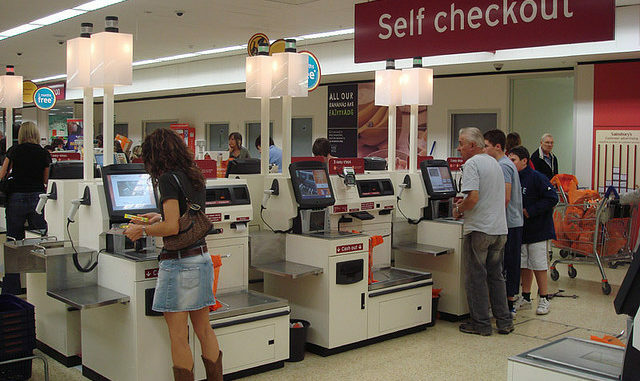 Self service kiosks are reducing the need for actual cashiers at some retailers. Earlier this year Amazon announced that their new retail stores will be almost completely automated. A new study has just come out with feedback from job seekers themselves. A new report titled “State of the American Job Seeker: Automation, AI and Technological Change” was published last week. It analyzes and explores data-based trends as well as the emotions of job seekers on matters such as their current satisfaction level with the job market, their feelings about technological advancements, and their take on automation and what it might mean for their current and future job prospects. 49% of employed job seekers say they “love” or “like” their current job. Women (35%) are twice as likely as men (17%) to “dislike” or “hate” their job. 58% of millennials (ages 18-37) “like” or “love” their job, and 62% say they are “fulfilled,” compared with 37% and 34% of gen Xers (ages 38-52) and 25% of baby boomers (ages 53+), respectively. More than 2 in 5 job seekers (44%) believe there is no such thing as a bad technological advancement. While most job seekers have heard of the term “job automation” (77%), less than 1 in 3 (30%) have an actual understanding of the term saying they are very familiar with it. Nearly 2 in 3 job seekers (64%) believe workers in most industries will be replaced with computers or robots in their lifetime. 60% of job seekers believe that fears around robots taking away jobs are overhyped, yet 7 in 10 job seekers who have heard of automation (70%) are actively looking for jobs less likely to be automated. For seekers, soft skills are becoming more important. Soft skills are more common. 50% of job seekers reported having science, technology, or engineering skills, while 79% of job seekers have soft skills. One-two punch. 47% of job seekers have both soft and STEM skills. Back to school. Affordability is the main hurdle when it comes to workers making investments in new skills; 67% of job seekers who don’t currently have these skills but are making an effort to obtain them are relying on self-training to acquire STEM skills (vs. 60% for soft skills).